Ian Poulter's six-shot halfway lead at the Turkish Airlines Open was overhauled as the Englishman shot a third-round three-over 75 in Antalya. Having completed a second round of 66 earlier on Saturday, Poulter struggled to recapture that form as he fired three bogeys and a double bogey. Australia's Wade Ormsby leads by one on 12 under after a third-round 68. 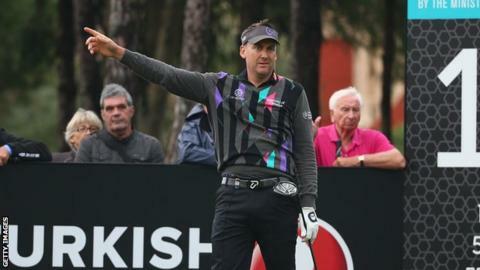 Poulter, countryman Lee Westwood and Germany's Marcel Siem are tied for second on 11 under. "That's brought a lot of players back into the fray," said Poulter. "Their dinner is going to taste lovely and mine is going to taste horrible." Siem, 34, is one of three players who can usurp Northern Ireland's Rory McIlroy at the top of the European Tour money list. The tournament is the third event of the Tour's Race to Dubai Final Series, which culminates with the World Tour Championship in Dubai from 20-23 November. Sergio Garcia, who along with Jamie Donaldson completes the trio who can pass McIlroy, shot the day's low round of 65 but remains seven shots off the pace. England's Danny Willett remains in contention on 10 under alongside American Brooks Koepka, with first-round leader Miguel Angel Jimenez a shot further back. Play was abandoned early on Friday because of thunderstorms, so players began Saturday by completing their second rounds. Poulter played the remaining four holes of his second round in one under, but bogeyed the first in his third round and never settled thereafter. The 38-year-old looked set to hang onto at least a share of the lead, but a superb eagle at the 18th from Ormsby ensured he would go into Sunday's final round with a slender lead. But he will have to contend with the in-form Siem, who continued his excellent form after his victory at the BMW Masters earlier this month with a fine round of 66.